The news out of Flint, Michigan brought the issue of contaminated drinking water into sharp focus, as it was revealed that officials at every level—local, state and federal—knew about lead-poisoned water for months but did nothing to address the problem. Under state-run systems like utilities and roads, poorer communities are the last to receive attention from government plagued by inefficiencies and corrupt politicians. Perhaps no group knows this better than Native Americans, who have been victimized by government for centuries. 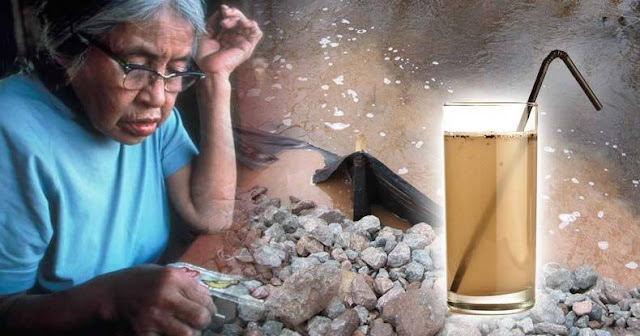 In the western U.S., water contamination has been a way of life for many tribes. The advocacy group Clean Up The Mines! describes the situation in Navajo country, which is far worse than in Flint, Michigan. Since the 1950s, their water has been poisoned by uranium mining to fuel the nuclear industry and the making of atomic bombs for the U.S. military. Coal mining and coal-fired power plants have added to the mix. The latest assault on Navajo water was carried out by the massive toxic spills into the Animas and San Juan rivers when the EPA recklessly attempted to address the abandoned Gold King mine. There is no comprehensive law requiring cleanup of abandoned uranium mines, meaning corporations and government can walk away from them after exploiting their resources. 75 percent of abandoned uranium mines are on federal and Tribal lands. Last week, Diné No Nukes participated in protests in Washington, D.C. to raise awareness of past and ongoing contamination of water supplies in the west, which disproportionately affects Indian country. “These uranium mines cause radioactive contamination, and as a result all the residents in their vicinity are becoming nuclear radiation victims,” said Petuuche Gilbert of the Laguna Acoma Coalition for a Safe Environment, the Multicultural Alliance for a Safe Environment and Indigenous World Association. “New Mexico and the federal government have provided little funding for widespread clean up and only occasionally are old mines remediated. The governments of New Mexico and the United States have a duty to clean up these radioactive mines and mills and, furthermore, to perform health studies to determine the effects of radioactive poisoning. The MASE and LACSE organizations oppose new uranium mining and demand legacy uranium mines to be cleaned up,” said Mr. Gilbert. Politicians continue to take advantage of Native Americans, making deals with mining companies that would continue polluting their water supplies. Senator John McCain sneaked a resolution into the last defense bill which gave land to Resolution Copper. Their planned copper mining would poison waters that Apaches rely on and would desecrate the ceremonial grounds at Oak Flat. While EPA and local officials have been forced to address the poisoned water in Flint, the contamination of Indian country water supplies continues. A bill called the Uranium Exploration and Mining Accountability Act, introduced by Arizona Congressman Raúl Grijalva, has languished in Congress for two years.